angle, start a 3-inch bandage around the instep for several turns to anchor it. 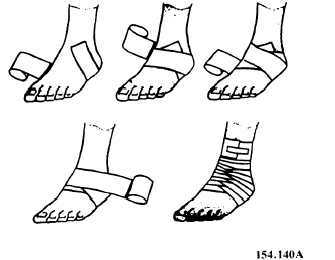 Carry the bandage upward over the instep and around behind the ankle, forward and again across the instep and down under the arch, thus completing one figure of-eight. Continue the figure-of-eight turns, overlapping one-third to one-half its width, with an occasional turn around the ankle, until the compress is secured or until adequate support is obtained (fig. 4-28). 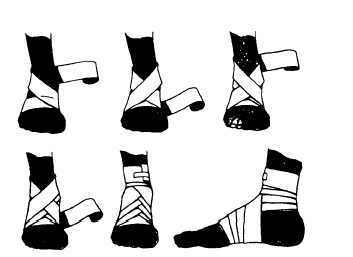 Figure 4-28.Roller bandage for the ankle and foot. ROLLER BANDAGE FOR HEEL. The heel is one of the most difficult parts of the body to bandage. Place the free end of the bandage on the outer part of the ankle and bring the bandage under the foot and up. Then carry the bandage over the instep, around the heel, and back over the instep to the starting point. Overlap the lower border of the first loop around the heel and repeat the turn, overlapping the upper border of the loop around the heel. Continue this procedure until the desired number of turns is obtained, and secure with several turns around the lower leg (fig. 4-29). Figure 4-29.Roller bandage for the heel. ROLLER BANDAGE FOR ARM AND LEG. The spiral reverse bandage must be used to cover wounds of the forearms and lower extremities; only such bandages can keep the dressing flat and even. Make two or three circular turns around the lower and smaller part of the limb to anchor the bandage and start upward, going around making the reverse laps on each turning, overlapping about one-third to one-half the width of the previous turn. Continue as long as each turn lies flat. Continue the spiral and secure the end when completed (fig. 4-30). Figure 4-30.Roller bandage for the arm or leg.